Governor Simon Lalong of Plateau State, has alleged that the current insecurity bedeviling the state is being orchestrated by “unpatriotic politicians” who can go to any length to achieve their political interest. 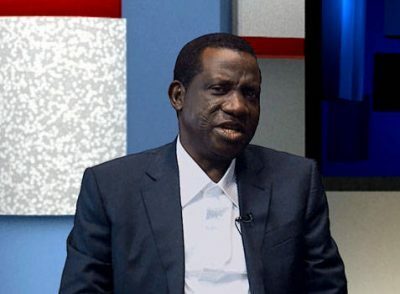 Lalong explained that even within traditional and religious leaders, there are politicians among them who are used to instigating crisis in the state. The governor made the allegation on Saturday during an emergency meeting held at a Dialogue Reconciliation and Peace ( DREP), center, in Jos South Local Government Area of Plateau state. The meeting was organized to dialogue and proffer solutions to the bedeviling crisis in the state which has its root since 2001 and has so far claimed hundreds of lives including security personnel. According to Lalong, “ The crisis are caused by politicians. When we say the crises is political, some say no. But it is political. Within traditional and religious leaders are found politicians. When it comes to politics, politicians can do anything to achieve their political interest. “I believe that religious and traditional leaders will not want trouble in their areas. “Sometimes, when someone is in power, another person will say he will make the government ungovernable for him. That is what we are faced with in plateau. Otherwise, there should be no reason for crisis in Plateau state. I have studied it. That is why, I still stand religiously on the “Berom / Fulani recommendation and passed it into law, “ the governor said. Governor Lalong, however called on politicians and all people of plateau to toe path of peace and harmony for development to thrive and forget what has happened. “ What has happened has happened. Today, we are looking for peace. We look at history not because of reopening it but because of correcting it in the future. I just approved employment of 350 people across the state to help us on information gathering. These people would help us get relevant information about what is happening so that if there is any problem, we will be able to nip it from the boot, “ Lalong said. It is the conquest of Sokoto which is underway. It is Revolutionary Militant Groups- RMG etc. formation which its members are the military, police etc. under the natives Disintegrated Republics- Biafra Republic of south east, Niger Delta Republic of south south, Oduduwa Republic of south west, North East Republic, North West Republic, North Central Republic. Fulani fraudulent criminal sultanate political government with its emirates which fulani illiterate cattle rearing touts uses to steal Democratic Capacity, Votes of northern natives, must be erased with the Sword on every inch of this natives territory of Disintegrated Republics in this final conquest which is the conquest of Sokoto which is underway. The brainwashed terrorism mercenaries nickname military, police etc. fighting for fulani fraudulent criminal sultanate political government with its emirates against this territory natives who owns the land and are more than 99% population of this natives territory, must be annihilated and erased on every inch of this natives territory of Disintegrated Republics in this final conquest which is the conquest of Sokoto which is underway. God given Victory is the natives. Only the Sword decides. God Is With Us!!! Do not move an inch backward on your God given native land. March on the enemy to full conquest in Sokoto. Strike point number one are the brainwashed terrorism mercenaries nickname military, police etc. fighting for fulani fraudulent criminal sultanate political government with its emirates against this territory natives who owns the land and are more than 99% population of this natives territory. God Is With Us!! !